Bowling is included in Wii Sports, and although the game is easy and fun to play there are other Wii bowling games available for the more serious bowler. Bowling on your Wii can be an activity the whole family can enjoy together. You could even plan a “league” night where you all compete against each other on a weekly basis. Here are some Wii bowling games that could present an alternative to your Wii Sports bowling option. 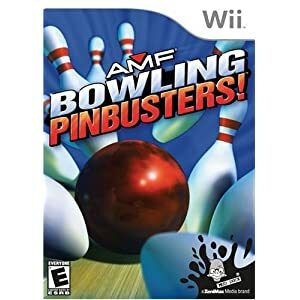 Pinbusters is not one of my favorite Wii bowling games, but it does present a unique experience. There are eight different characters you can choose from, including a laid back surfer, a punk rock girl, and a stylish rapper. This game presents more of a party atmosphere to the game of bowling as it features strobe effects, neon lights, and even mirrored balls. AMF Bowling Pinbusters also includes mini-games such as Pool Bowl and Obstacles. You can play solo or take on up to three opponents. Unfortunately, however, the ball control is not good and there is a lot of repetition in both movements and dialogue. 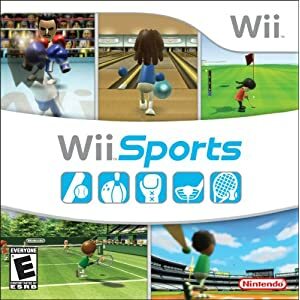 For a change of pace this game will serve it’s purpose, but in my opinion you’re better off just sticking with your Wii Sports game. Much the same can be said about the 2008 AMF Bowling: World Lanes. The lanes consist of various country themed lanes from all across the world. This new AMF bowling game now gives the player a choice of 12 different characters and includes several mini-games as well as a left-handed bowling option. While it may be a minor upgrade from Pinbusters, World Lanes is also not one of the better bowling games you will find. This was originally released in the middle of 2007 and can at least present a better option than the previous games. You can compete either individually or participate in multiplayer matches. The game features a “Career” mode in which you can advance your way from an amateur to a professional bowler during a season of tournaments. You will visit ten real-life Brunswick Bowling Centers as you advance your way through your career. You can also choose the “Quick Play” mode and just begin bowling. The game also includes the chance to unlock things such as bowling balls, clothes, and venues in every mode. 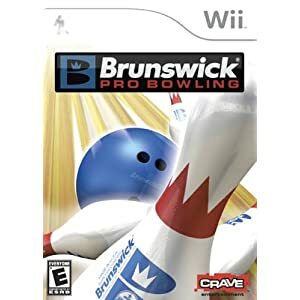 Brunswick Pro Bowling is definitely an upgrade over the AMF games, and could be worth a small investment if Wii bowling is one of your favorite things to do. 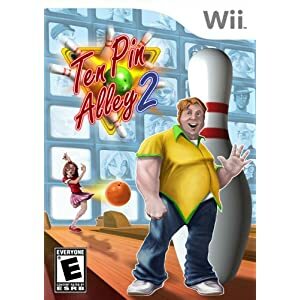 The Ten Pin Alley 2 Wii bowling game was released towards the end of 2008 and kind of falls into the same category as the first two. It is a bowling game that tries to keep things fun, but features a choice of only nine different characters. There are five different game modes with six unique choices of lanes and trick shots are also made easy, but the game gets boring quick and that new game feeling will fade fast. If your going to buy a bowling game, I’d still lean towards Brunswick. This is a pretty cool bowling concept, as you are taking on opponents that includes legendary creatures from earth and beyond. Aliens, werewolves, vampires, and zombies are just some of the foes you will face in your showdowns. Each opponent has a special ability that they will surprise you with but you can surprise them right back by using special abilities to twist the lane, fire lasers, or create an earthquake, among other distractions. Alien Monster Bowling League also features special balls that you can use, such as a Clone Ball, Ghost Ball, and Sonic Ball. There are four modes you can play in. “Multiplayer” mode lets you face off against a friend and “Quick Play” mode lets you just start bowling. In “Campaign” mode you can face off against progressively weirder opponents, and in “Regular” mode you can play without the Whammies or power ups for times when you just want to bowl. The game also features Wii Motion Plus technology and may be the best choice because of it’s options and ability to play a regular game of bowling if you wish. 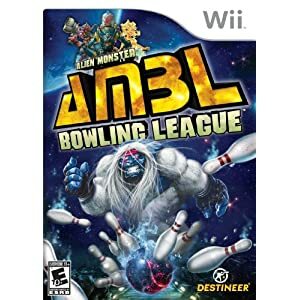 While the Brunswick Bowling game may be the better option for those who take bowling seriously, this game is a good choice for people who want to add a little pizazz to their Wii bowling experience. A Wii Bowling Ball can be purchased to give you a more realistic bowling experience. The Wii remote fits snugly into the ball and it also features 6 removable finger plugs. 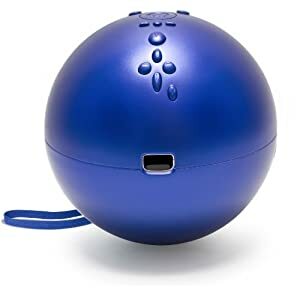 Simply press the release button that splits the ball in half, place the Wii controller in it and close it up and you’re ready to start your game. Put your three fingers into the holes you choose and start rolling like a champion.This is one Wii accessory that every Wii bowler will appreciate. If you are happy with your Wii Sports bowling game, then you may want to just continue using that. For those who want to add a little fun and excitement, Alien Monster Bowling league may be the best choice for you. I think for anyone that wants to take their Wii bowling seriously, however, that Brunswick Bowling is the best choice.